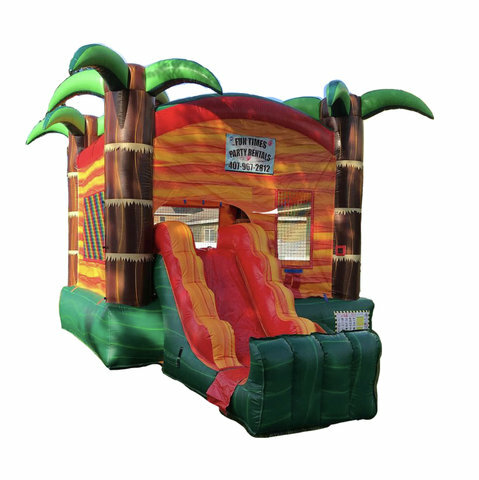 Dry Bounce House Combo - "Sunburst Palms"
Our inflatable "Sunburst Palms" bounce house dry combo is the newest and best around, recommended for ages 3 - 10. This bounce house combo offers a large and spacious jump area, basketball hoop inside, small climbing wall and slide perfect for your little ones. This bounce house is perfect for any party, event or festival you name it! We service Clermont, Winter Garden, Groveland, Ocoee and surrounding areas. Be sure to add on our new Soccer Darts / Baseball Darts Challenge to help entertain everyone at your event.